While most the world knows today as Halloween, on the church calendar, today is All Hallow’s Eve. This is an important link to All Saint’s Day and the Reformation. In 1516–17, Johann Tetzel, a Dominican friar and papal commissioner for indulgences, was sent to Germany to raise money to rebuild St Peter’s Basilica in Rome. Luther objected to a saying attributed to Johann Tetzel that “As soon as the coin in the coffer rings, the soul from purgatory [also attested as ‘into heaven’] springs.” He insisted that, since forgiveness was God’s alone to grant, those who claimed that indulgences absolved buyers from all punishments and granted them salvation were in error. Christians, he said, must not slacken in following Christ on account of such false assurances. The sale of indulgences shown in A Question to a Mintmaker, woodcut by Jörg Breu the Elder of Augsburg, circa 1530. 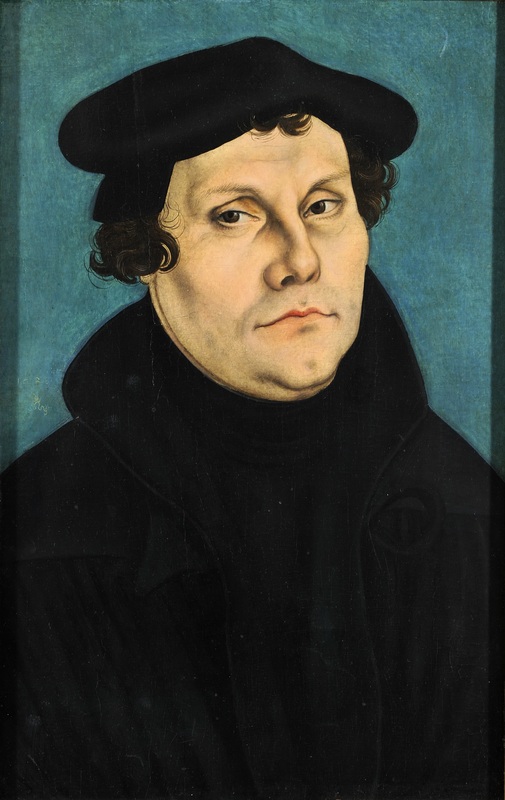 According to Philipp Melanchthon, writing in 1546, Luther “wrote theses on indulgences and posted them on the church of All Saints on 31 October 1517”, an event now seen as sparking the Protestant Reformation. Some scholars have questioned Melanchthon’s account, since he did not move to Wittenberg until a year later and no contemporaneous evidence exists for Luther’s posting of the theses. Others counter that such evidence is unnecessary because it was the custom at Wittenberg university to advertise a disputation by posting theses on the door of All Saints’ Church, also known as “Castle Church”. As I was browsing through my feed reader today, I found several interesting articles on the Reformation and what it means to us today. I learned something new about this today. This creed is different than what we usually say is the Nicene Creed. The part that follows the teaching about the Holy Spirit is part of the Creed of Constantinople. Which we will learn about next week. This has been an amazing weekend. It started on Thursday during our small group as we studied the concept that God is our loving heavenly Father. Yesterday, I woke up and waited so Anna could go to work and I could go out for a long run – which was amazing in and of itself. James, Pam and I were able to spend most of the rest of the day together as we got ready for tonight’s Trunk-or-Treat. This morning we got up and prepared our hearts for worship at Parkway – and we had a good service. We started the day with a great hymn, “A Mighty Fortress Is Our God,” Promise Keepers style in honor of Reformation Day, which also happens to be October 31. You may wonder why a Wesleyan would honor Luther, but it just so happens that John Wesley was reading Martin Luther’s Preface to the Book of Romans the night he found his heart “strangely warmed” and the Methodist movement begun. Martin Luther declared that salvation was by faith alone through grace and our worship set reflected that sentiment as we sang “Grace Greater Than Our Sin” and introduced “Your Grace Finds Me.” Pastor Barry preached a great message to complete our worship package. This afternoon was spent getting prepared for our Trunk-or-Treat. We had a great time as over 60 children and their parents came to our church for treats and snacks. It was great – I wore the Chick-fil-A cow costume and we handed out coupons for free Ice Dream Cones at our local Chick-fil-A. Thank you to all who helped with the evening. Many hands indeed made light work. Now it’s time to call it a night. This week looks to return to a little more sense of normalcy. Have a great week and keep pressing on! Almighty and everlasting God: Increase in us the gifts of faith, hope, and charity. And, that we may obtain what you promise, make us love what you command. Through Jesus Christ our Lord, who lives and reigns with you and the Holy Spirit, one God, for ever and ever.